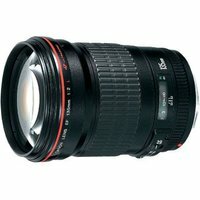 The Canon EF 135mm f/2 L USM lens is a fast, lightweight telephoto prime for advanced amateurs and professionals. Ideal for portrait and sports photography, the lens delivers fast, quiet focusing, and has a wide f/2.0 aperture that delivers a soft, beautiful bokeh effect. Two UD-glass elements correct secondary spectrum for outstanding sharpness and colour. A lens hood and soft case are included.